When I was a kid, I wanted nothing more than to be Superman. Or maybe it was Batman, or Spiderman. To be honest, I cannot keep all of my many childhood superhero fantasies straight. What is the appeal of comic book superheroes that makes children and even grown adults envy them so much? Perhaps it is the special powers, or the cool looking costumes, or more simply, the idea of being extraordinary in a seemingly ordinary world. Unbreakable explores this idea by giving us a portrait of an apparently simple, everyday man named David Dunne, and showing us how he reacts to the realization that he might just be someone extraordinary. Surprisingly enough, David does not embrace it in the way that we might have envisioned in our adolescent daydreams, but rather treats the possibility with hesitation and insecurity. This is just one of the many interesting ways in which writer/director M. Night Shyamalan takes a fantasy story and delivers it on a dramatic level with touching realism. After emerging the sole survivor of a horrible train wreck with nary a scratch or broken bone, David begins to question his existence. He is led to the enigmatic Elijah Price, a comic book art gallery dealer whose genetic disorder "Osteogenesis Imperfecta" causes his bones to break like glass. Elijah's interest in David is simple: "If there is someone like me in the world, and I am at one end of the spectrum, couldn't there be someone else the opposite of me at the other end?" An unbreakable man, perhaps? We are constantly reminded of Elijah's obsession with David, but we never quite know what lurks behind his passion to find an unbreakable man. The film relies heavily on this kind of labyrinth level of mystery to convey its effectiveness. Shyamalan's passion for characters that seem to blend into the normalcy of day to day life gives his story the freedom to breathe on numerous levels. On one, it is about a man unlocking the doors to his fullest human potential. On another, it is the simple story of a family trying to work beyond the barriers that divide them. At its most simplistic, it is the origins of a superhero discovering the nature of his powers. All of these possibilities come together to form engagingly cohesive entertainment, backed by incredibly honest performances. As the reluctant David Dunne, Bruce Willis portrays his character with tremendous pathos and restraint. Samuel L. Jackson is his usual mesmerizing self as the optimistic yet bitter comic book art gallery dealer, Elijah Price. Perhaps the most desirable performance comes from the wonderful Robin Wright Penn, whose melancholy sweetness is a breath of fresh air in a genre usually dominated by male characters. Shyamalan approaches his subject matter with a confidence and elegance rarely seen in films today. It is apparent that he has planned the style and tone of his vision down to the smallest detail. Moods are masterfully created through elaborate shot structures and lighting techniques; the resulting effect is a movie without one single superfluous frame. The intentionally hushed dialogue and long, drawn out takes may cause some viewers to squirm in their seats with impatience, but a closer look will identify that there is much more than meets the eye. Since the audience is required to pay strict attention, many viewers may also miss the point of the trademark Shyamalan twist, and treat the ending with either apathy or exasperation. Yet, closer inspection will prove that the revelation could not come at a better time, and without it, the rest of the film would simply cease to have coherent meaning. As the story unfolds, Shyamalan injects subtle clues as to its true nature, and part of the fun is identifying the hints that are scattered throughout. It is quite possible that this film will play better a second or even third time, due to the fact that every twist and turn is an enigma wrapped in a riddle. 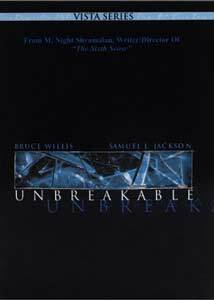 It is unfortunate that the success of such an interesting film as Unbreakable was largely dependent on the pressures for Night to recreate the mass appeal of his prior film, The Sixth Sense. It seemed that no matter what Night chose to tackle for his controversial follow up project, he would inevitably fall into the trap of "Damned if I do, and damned if I don't". While I will refrain from making direct comparisons between the two films, I will go on the record to say that Unbreakable is a wholly engaging, individual piece of work, and like the best films, continues to entertain on multiple levels, long after the first viewing. Image Transfer Review: The anamorphically enhanced 2.35:1 image transfer is overall rather pleasing, if a little inconsistent. As a whole, the film-like picture carries a soft characteristic with a minor detection of grain. Black level is of the utmost importance in this film, and it is accurately deep, dark, and solid. Contrast is nicely balanced and exhibits wonderful shadow detail in the darkest of scenes, yet some heavily backlit interior shots suffer from white level overkill. The use of color is exemplary and beautifully rendered with a vivid and lifelike quality. The only time I found color saturation to be anything short of breathtaking was in some of the visually "warm" scenes. Edge enhancement is evident, albeit minor; I did not find its presence to be bothersome. Although the image quality is not quite up to par with the reference standard of today's best transfers, this is a pleasant transfer with no glaring distractions. Audio Transfer Review: The 5.1 soundtrack is an absolutely remarkable achievement. While not the whiz bang action fare that normally receives such high marks on the audio bench, Unbreakable subtly utilizes the capabilities of a digital soundtrack to create an enormous sense of realism. Even during scenes of extreme quiescence the soundfield is creatively engaged to draw the audience further into the heart of the story, such as chapter three when the Doctor interrogates David Dunne. When necessary, these whisper-quiet scenes are counterbalanced with bursts of extreme intensity, backed by a powerfully deep and clean LFE track. Even when the soundtrack explodes to the peak of its dynamic range, dialogue is never compromised, and fidelity is always first rate. Split surrounds are generously active when necessary and heighten the sense of space without ever sounding gimmicky (hearing the realistic nature of the intruder's footsteps during chapter twenty-three made me want to run upstairs and make sure someone hadn't broken into my home). James Newton Howard's masterful score soars through all of the speakers and creates a rich and fully enveloping sound presence. Unbreakable on DVD is a stunning auditory experience that further displays how a multi-channel soundtrack greatly enhances the home theater environment. Extras Review: While some fans may be disappointed in the lack of extras on this two-disc set, I am a firm believer in quality over quantity, and all of the extras included are top notch. Additionally, all of the special features are presented in anamorphic widescreen, a wonderful practice that I would like to see become the norm.Upon popping in each disc, we are treated to simple and tasteful menu screens that effectively make use of James Newton Howard�s musical themes. Disc one is completely void of special features, no doubt to leave room for the multitude of 5.1 tracks. Moving on to disc two, we begin with two short documentaries.The first documentary, titled The Art Revealed: Behind the Scenes of Unbreakable, is one of the more interesting features I have seen in a long while. While I still must mention my great disappointment with the unacceptable running time (just under fifteen minutes), I actually found this segment to be more comprehensive than many two-hour documentaries. From the initial conception of M. Night Shyamalan's script to the careful nature in constructing the film's visual design, the viewer is provided a concise look at the production as opposed to the mindless boring fluff that seems to dominate so many behind-the-scenes features these days. Fascinating tidbits are revealed, such as the significance of color for a simple post-it-note and the misunderstood importance of Samuel L. Jackson's hairstyle. Anyone who appreciates Mr. Shyamalan's attention to minor details will certainly value this telling documentary.Comic Books and Superheroes is a less attractive documentary that discusses the allure of comic books and the heroes who grace their pages. This segment of interviews with industry professionals such as Alex Ross, Frank Miller, and Trina Robins does offer an interesting viewpoint on the superhero phenomena, yet I found these people to take comics much too seriously, causing their comments to become borderline laughable. Nevertheless, this section certainly ties in with the theme of Unbreakable, and I think any fan of comic books and superheroes will find it gratifying.Next up is The Train Station Sequence: Multi Angle Feature. Here the viewer can have some remote control fun by using the angle button to toggle back and forth between M. Night Shyamalan�s initial storyboards and the corresponding finished sequence in the film. I was amazed at how closely the shots in the film mirrored Night�s storyboards, proving without a doubt that he had a meticulously preconceived vision for the film's shot structure. Additionally, three audio tracks are offered; 5.1 final mix, 5.1 music score only, and 5.1 effects only, none of which can be selected "on the fly" using the remote control audio button, which is disappointing. It is truly a beautiful event to hear James Newton Howard's score in 5.1 isolation during this feature, but at the same time its inclusion only made me more hungry for an isolated 5.1 musical score track over the main feature. Overall I had a lot of fun with this segment; it would have been nice, however, to have the opportunity to utilize this feature for more than just one scene.The Deleted Scenes are presented with fully produced 5.1 sound and anamorphic widescreen transfers that look as good as anything seen in the main feature. This section unquestionably sets a standard for the method in which all deleted scenes should be presented on DVD. M. Night Shyamalan gives an introduction for each scene, offering comments on why a particular scene had to be cut and the hardships of doing so. Night is a pleasant host, and I certainly appreciated him encouraging me to "have fun" while viewing a particular scene. The integrity of the scenes ranges from very interesting to ludicrous, and while I did appreciate seeing them, I agree with the decision to exclude all of them from the main feature.Night's First Fight Sequence is a short clip of a film (or video) that Shyamalan created as a teenager. The inclusion of this admittedly immature and generic effort at filmmaking could easily be dismissed as self-indulgent since it has no bearing on the featured film. However, this short clip is a fun opportunity to see just how far Night's talents have come, and I found it to be an absolute hoot.Oddly, no promotional materials are present at all, not even the film's haunting theatrical trailer. In a world where trailers now give away all of a film's secrets, the Unbreakable trailer proved to be a masterstroke of ambiguity and tension; its inclusion on this DVD should have been mandatory. Unbreakable is the type of film that certainly divides audiences into the distinct categories of love and hate. Members of the "love it" crowd should definitely be pleased with this beautifully packaged, two-disc set from Buena Vista, despite what some may consider a lack of supplemental material. Members of the "hate it" crowd will more than likely continue to do so. Anyone left who has not yet seen it should at least rent the DVD and, as M. Night Shyamalan might say, "Have fun."